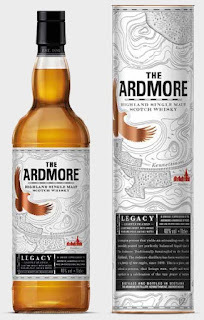 The Ardmore Legacy celebrates the distillery’s unique location on the fringes of the Highlands, offering a lightly peated liquid that is sweet and uplifting. The gentle flavour fully captures the essence of this spirit’s stunning Highland home. The Ardmore® Legacy will appeal to experienced peated malt drinkers and newcomers, alike. Nose - Heather Honey with hints of cinnamon and toffee bonbon. Very subtle hints of peat smoke. Palate - Creamy vanilla spice gives way to more overt smoky charcoal notes, especially with the addition of water. Smoke doesn’t dominate and is balanced by the sweet honey and spice flavours. Finish - Full bodied, silky mouth feel with a dry, tangy and lingering aftertaste, coupled with delicious spice notes. Ardmore Traditional Cask redefined the Single Highland Malt Scotch experience in the United States. Masterfully crafted from the only Highland distillery that consistently peats its barley, Ardmore weaves bold smoky flavor notes historically associated only with Islay malts into the rich Highland malt experience. 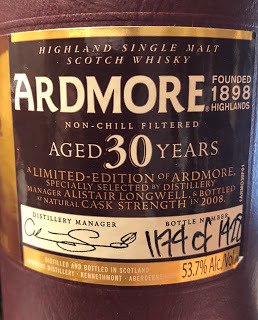 Expanding on this unique combination of flavors, Ardmore will unveil a limited edition 30 year old in 2009 available only in the United States. Aged in former bourbon barrels and handmade quarter casks, the new ultra-premium Scotch bears the same name and pedigree as its predecessor, but reveals a distinctive finish and rich, complex flavor all of its own. Only 1428 bottles, with each bottle individually numbered, will be available.